Ozu’s later films are perhaps more grounded in the traditions of the Japanese family unit. Their drama comes from an apparent change in value systems (often a systematic change to more western values) or the opposite of this where characters are bound rigidly by Asian tradition and are desperate to escape. The music in Ozu’s sound films are an amalgamation of themes and influences, sometimes making them hard to pin down as specifically. There are however some characteristics that stick out, often brought to the fore by explicitly Asian diegetic music. 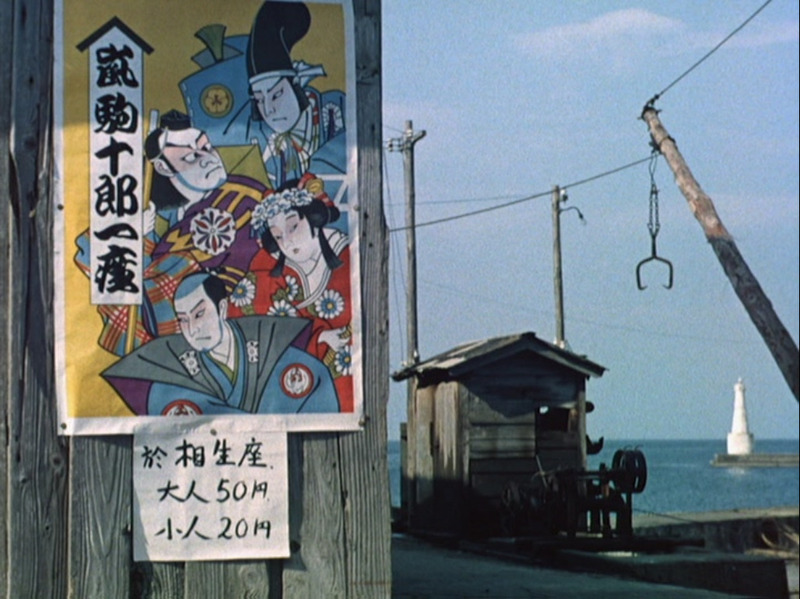 Floating Weeds (1959) is one of Ozu’s later films and is apt for discussion for a number of reasons. Though its non-diegetic music varies in Asian identity, even hinting at modernity and western influence, its narrative is grounded in Asian tradition. It is also a remake of his earlier film The Story of Floating Weeds (1934) so also manages to create comparisons with his obviously more traditional, silent work. Floating Weeds at once seems contemporary, applying a breaking of Japanese tradition no doubt seen as high drama at the time. Cousins describes Ozu as “the great dethroner”; an apt title in the context of Floating Weeds which showcases the ultimate dethroning through the loss of the respect of one’s son. Narratively, the film also addresses the question of Asian cultural formation by showing how quickly the Japanese traditions in arts were becoming something to be quietly mocked after the Second World War. Komajuro is the leader of a travelling troupe who arrives in a seaside town in the south of Japan. Komajuro has visited before and has an ex-lover and son there who knows him only as visiting uncle. The secret of his fatherhood has been kept from the boy all of his life and he considers his uncle a loveable but bumbling character with an extremely silly job. The troupe perform traditional Japanese Kabuki theatre plays, much to the dismay of the boy who is more concerned about getting a highflying, city based job. Though the majority of the storyline is taken up with the jealous, current lover of Komajuro persuading a younger girl in the troupe to seduce his son in order to humiliate him, it is of little concern here. Instead the relationships showcase the increasing persistence of modern values, highlighted in the clash between the non-diegetic, Romantic style soundtrack and the diegetic sounds of the traditional Kabuki theatre music. It seems as if the former represents the youthful, vibrant Kiyoshi while the latter naturally becomes a diegetic leitmotif for Komajuro. The score even enjoys the explicit use of harmonica, no doubt influenced from western genre film though according to Richie, both films are based on an earlier, American picture; “Both are consequently faithful to the plot of the American film that is said to have inspired the original script (The Barker (1928))” (2011, p.2). The score however is often underpinned by an interesting use of xylophone, adding some Asian tonality underneath the more typically un-Asian sounds. During some of the performances of the Kabuki theatre, dance scenes are scored with what could be described as the earliest forms of J-Pop. Though the music seems overtly classical, this is viewed in such a way as comparing a singer like Frank Sinatra to a singer like Johnny Rotten. The popular music (which is played diegetically over a speaker) is popular music of the era and has much in common with crooners from across the globe only with some added Asian tonality and lyrics sung in Japanese. This chimes well with Gorbman’s theory that “tonal relationships in the score are also managed so as to contribute to a sense of the film’s unity” (1989, p.90). Whether modernity in Asia should be represented purely by American influence is debatable. There are plenty of elements in the non-diegetic score that have come from Japanese musical traditions, though perhaps its more American side tells of a desire for Shochiku Studios to break new ground in foreign markets more than anything particularly cultural. “A characteristic feature of Japanese music is the importance of narrative and recitative, which brings to it a literary function that marks it part from music in a more occidental meaning” (Scott, 1955, p.66) is a description of the original use of Kabuki theatre music. This logic acknowledges the use of heightened, westernised score. Saito’s music is interesting in that it sums up the disparaging relationships between the older and younger generations in Japan by using a mixture of obviously traditional Asian instrumentation and western film score stylistics. Saito produced a handful film scores for Ozu including the score for his 1953 masterpiece, Tokyo Story; another film about the generation gap being widened by the changing of Asian family values. Unlike the narrative grounding that Floating Weeds would provide later on, Tokyo Story proudly wears its cosmopolitan score. The placing of it chronologically before Floating Weeds might necessitate the argument that Ozu had always been doing this and, in fact, that it was normal for classical Japanese cinema to use more Hollywood styles of scoring than those of traditional Japanese music[iii]. Ozu, in the bright light of hindsight, can be seen as the defining director of classical Japanese cinema. Thanks to this, his techniques and practices can also be considered to be traditional even if, at the time, they were obtusely modern. It seems fitting then that his death at the beginning of the 1960s also highlights the death of Japanese classicism and the birth of what some deem as the Japanese New Wave; a movement that gives way to all sorts of new musical practices, many of which will be seen in the second group of case studies. [i] There appears to be some discrepancies concerning the scoring of Ozu’s later films. Saito is most definitely the surname of the composer but whether it is Kojun Saito or Tokanobu Saito varies depending on which source is used. They might even be the same person but IMDB have Tokanobu down as the composer for Floating Weeds and Tokyo Story while Criterion and the Ozu Music Anthology list both of those as compositions by Kojun. The mystery deepens further as the Ozu Music Anthology lists the score for Late Autumn (1960) as being by Kojun but the BFI accredit the music to Takanobu. For the sake of accuracy, the composer for the films is question is simply referred to throughout as Saito. [ii] This is further heightened by the fact that the last shot is of a train leaving in the night. [iii] Especially when considering someone like Kurosawa, no doubt Japan’s most world renowned director but also the most western influenced.